Earlier this month California Pacific Airlines ended all of their flight operations temporarily. The airline notes that the reason for the abrupt shutdown of their operations was due to pilot staffing and the shortage of pilots in the United States. Other sources indicate that California Pacific Airlines may be having financial issues. The airline’s Essential Air Service flights to Pierre and Watertown, South Dakota have been canceled and the airport authorities in that region are reporting that the airline is behind on airport usage fee payments. California Pacific Airlines was launched last as part of a reorganization of Aerodynamics, Inc, an airline involved with Essential Air Service contracts in the U.S. The new California Pacific Airlines was to operate flights out of Carlsbad, California as part of a long-term project to launch an airline based in Carlsbad. After failed attempts at getting an air carrier operating certificate from the FAA and the DOT, the California Pacific team bought Aerodynamics, Inc and obtained an operating certificate as a result. The company re-branded Aerodynamics as California Pacific and the airline launched flights out of Carlsbad in November 2018. The airline’s plan to fly out of Carlsbad has come to an end for now. Some of the factors that contributed to the airline’s decline include that it is difficult to start a point-to-point airline out of a small/medium sized airport and that the airline was launched at a time where the U.S. economy was slowing down. Above California Pacific Airlines Embraer ERJ-145 photo by Ryan DiVita on Wikimedia Commons. Enhanced by FlyRadius. The above photo is released under a Creative Commons Attribution-Share Alike 4.0 International license. Can California Pacific Airlines be saved? Yes, however, it will likely require a capital infusion and a reorganization of its operations and business plan. California Pacific Airlines will need to change its business plan to move to a hub-based system to increase passenger traffic on its flights. A hub at Carlsbad, California would help the airline fill more seats. The airline could then offer connecting flights to destinations in the Southwest, which would include Phoenix, AZ. A customer from Reno or San Jose could then fly to Phoenix on the airline's flights. The airline could also market quick connections as it has a small operation at Carlsbad. In addition, California Pacific Airlines would need to modify its Carlsbad operation to support connections. The connections would open up more opportunities for customers and allow the company to have stable operations. To stabilize its operations, California Pacific Airlines should also adjust its route network. Oakland should replace San Jose in its route network. Out of San Diego International Airport, San Francisco, San Jose, and Oakland are among the top 10 destinations according to data from the DOT. Oakland is a solid location that can attract traffic to and from San Francisco and the rest of the Bay Area. The North and East Bays would be in close proximity and San Francisco is only 20 miles away from Oakland. The airline could also look to connect various California cities to Southern California. These locations could include the central valley and Northern California. In addition, shuttle flights to the Los Angeles area and potentially San Diego could be beneficial to the airline. Also, Oakland may be another option for an additional hub. Its central location in California makes it ideal for northern flights and access to significant markets. The airline should add additional ERJ-145 jets or change aircraft to the CRJ200 and CRJ series jets. Embraer does not a have a compatible upgrade aircraft that has significant commonality with the ERJ series. The larger aircraft that Embarer has, the E-Jet series, is a significantly different aircraft than the ERJ series jets. On the other hand, the CRJ700 and CRJ900 have commonality with the CRJ200, which could help with future expansion. 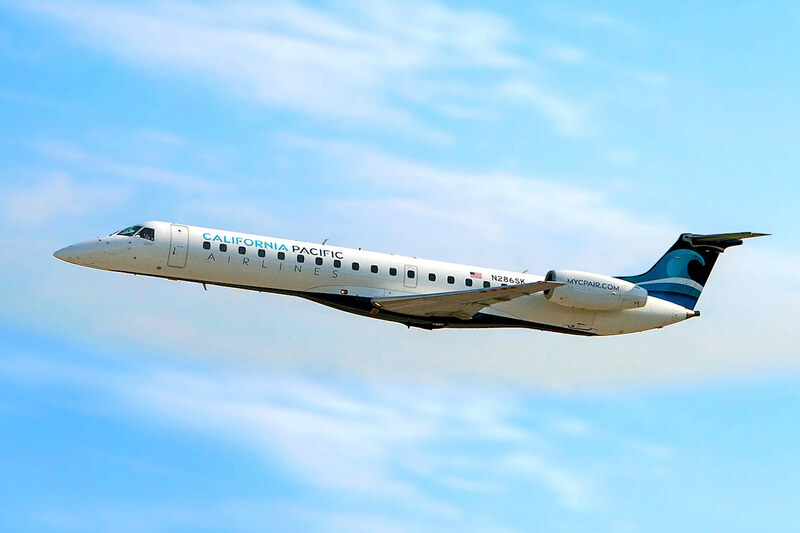 An example of a small airline benefiting from the CRJ series commonality is Elite Airways. Even though the CRJ series may be better than the ERJ series, the easiest route to take at this point would be to add ERJ-145 jets to support operations. To continue operating at this point the airline will need to raise capital to make the needed changes to its operations and ensure that it can provide quality flight services to its customers. Capital to purchase aircraft outright and support hub operations would be needed. This will the most difficult part of the restructuring; however, a solid capital base will allow the company the right amount of time to develop operations. California Pacific Airlines can restructure and exit out of an Aircraft on Ground situation, however, changes to its business plan, operations, and additional capital will be needed. By expanding its operations to include a hub, modifying its route network and fleet, and adding significant capital, the airline can succeed. We wish the airline the best.